It was front page news in the Times, but the Times did not report events leading up to it as they unfolded. This is about a major local and national news story that the New York Times didn’t cover as it unfolded . . .
Ocasio-Cortez did it with people power, defeating the money. Crowley outspent Ocasio-Cortez significantly, by perhaps more than 8 times, with a recent set of tallies from Politico for April through June 6th giving Crowley expenditures of $1.1 million versus $128,140 for Ocasio-Cortez. I heard on the Jimmy Dore show after the election (June 28th- June 30th) that the New York Times never covered the campaign of Alexandria Ocasio-Cortez before she won. Could this be true? I checked it out: It is basically true, plus the Times never ran a picture of her as candidate either. How did Alexandria Ocasio-Cortez win the election if her campaign wasn’t being reported on by mainstream media and the paper of record, the New York Times, the principal newspaper for her hometown of New York City? The Jimmy Dore Show offered the satirical suggestion the voters got into the voting booth and just made a lucky guess. By contrast, The Jimmy Dore show proudly crowed that it covered Alexandria Ocasio-Cortez as an insurgent candidate worth paying attention to a year ago. Some things worth knowing about Ms. Ocasio-Cortez: She is frequently referred to as a "progressive," sometimes as a "grassroots progressive," to distinguish her from the faux-mantel progressives (or "fauxmanteau progessives"), corporate democrats dominating the Democratic party like NYC mayor Bill de Balsio or councilman Brad Lander (locally) who inoffensively give largely safe lip service to certain social ideas, but stow away any principled response when confronting money and establishment power (aligning with such power to sell off public assets like libraries). Ms. Ocasio-Cortez, like Bernie Sanders the man she previously campaigned and organized for, refers to herself as a "Democratic Socialist." She is for single-payer universal health care, government-funded higher education, the abolition of ICE (a post 9/11 agency founded in 2003), and she seeks justice for Puerto Rico now targeted in a brazen privatizing attempt to transfer the island from its people to wealthy profit seekers. This means she is considerably to the left of the New York Times and the usual establishment interests that Democratic and Republican parties serve. 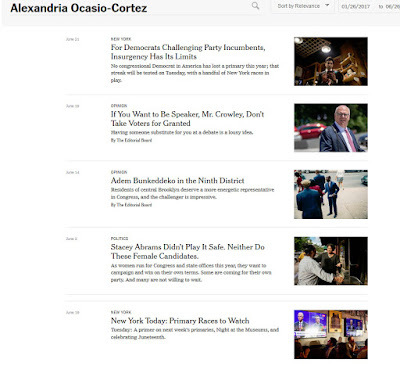 As for verification of the assertion on the Jimmy Dore Show that Ms. Ocasio-Cortez’s campaign was not covered by the Times before her win turned the world of mainstream media political coverage upside-down, if you go to the New York Times site and do a date restricted search to discover mentions of Ms. Ocasio-Cortez’s campaign you find mentions of it in just five articles, and essentially no coverage that would tell you who she was or what she stood for as a candidate or indicating the strength and attraction of her campaign or what her win would signify. Just five articles mentioning the Alexandria Ocasio-Cortez before the election. 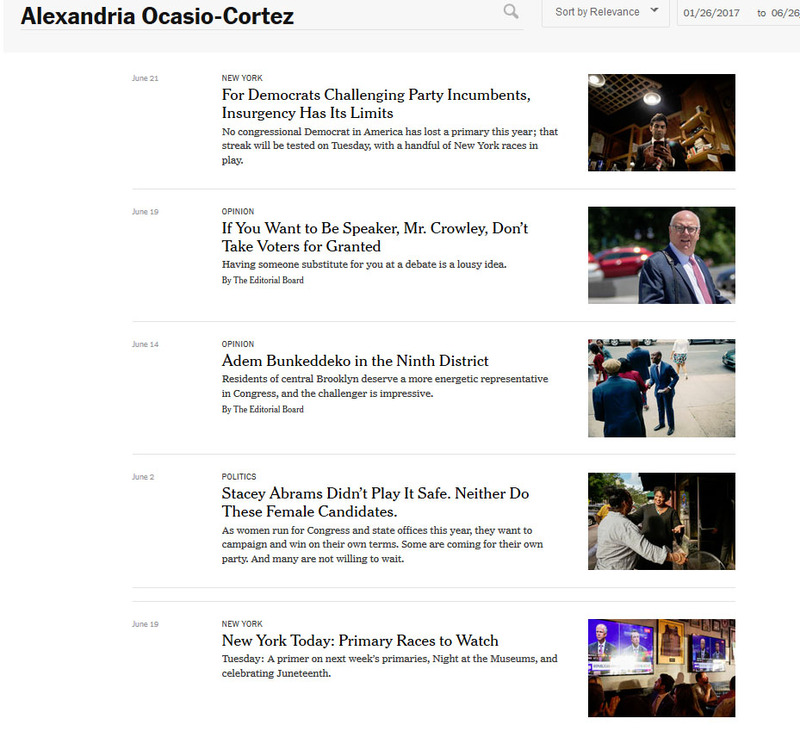 Hilariously, the New York Times has subsequently treated her win as so important that if you search its site without date restrictions you now get lost in a sea of more than 60 headlines (so far) virtually all published in just a few day's time. 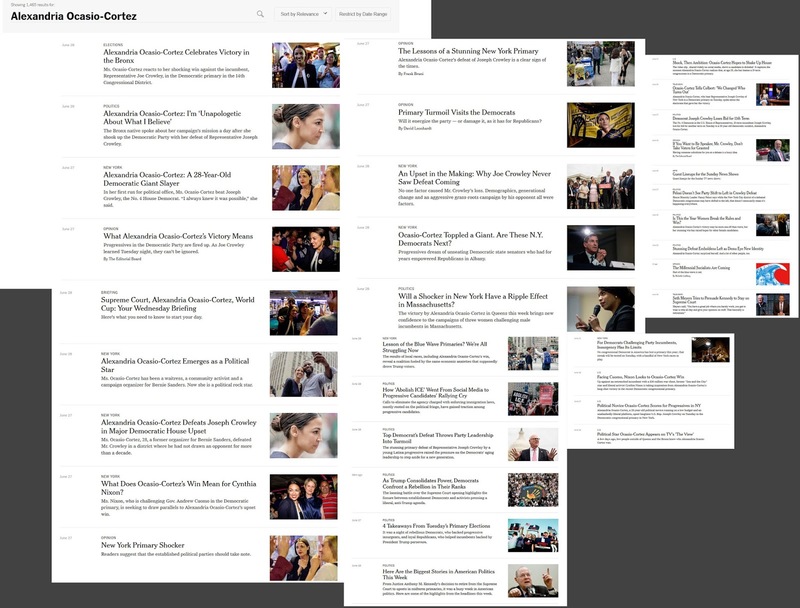 If you search the Times now, you will get lost there are so many articles about Ms. Ocasio-Cortez, more than 60 mentioning her since her primary win. Stacey Abrams Didn’t Play It Safe. Neither Do These Female Candidates, by Susan Chira and Matt Flegenheimer, May 29, 2018. The question went out late one night on a private message chain of insurgent female candidates for Congress: Do you really attack a fellow Democrat? Within the hour, peers from Texas, Washington State and North Carolina had weighed in: Keep up the fight. “We’re not trying to ask permission to get in the door,” Ms. Ocasio-Cortez, a 28-year-old organizer on Bernie Sanders’ presidential campaign, said in an interview. Opinion: Adem Bunkeddeko in the Ninth District, by The Editorial Board, June 14, 2018. In the 14th Congressional District, which spans Queens and the Bronx, Representative Joseph Crowley is defending his seat against an insurgent campaign from Alexandria Ocasio-Cortez, a former campaign organizer for Senator Bernie Sanders of Vermont. Mr. Crowley, the Queens Democratic leader, has ambitions of succeeding Representative Nancy Pelosi as the House Democratic leader that could redound to the city’s benefit. But Ms. Ocasio-Cortez, 28, has won an impressive measure of support, casting herself as a grass-roots alternative to an incumbent with deep sway in local politics. New York Today: Primary Races to Watch, By Jonathan Wolfe, June 19, 2018. Democratic upstarts in the city. A group of incumbent Democrats in New York are facing primary challengers, many of whom are first-time candidates under the age of 35. Representative Joseph Crowley, who some see as possibly replacing Nancy Pelosi as the head of the House Democrats, is being challenged for the first time since 2004, by the progressive candidate Alexandria Ocasio-Cortez. Representatives Carolyn Maloney (Manhattan’s East Side and parts of Queens), Eliot Engel (the Bronx), Yvette Clarke (central Brooklyn) and Gregory W. Meeks (southern Queens) are also facing insurgents within their party. Opinion: If You Want to Be Speaker, Mr. Crowley, Don’t Take Voters for Granted, by The Editorial Board, June 19, 2018.
. . Indeed, the snubs should be galling not only to Ms. Ocasio-Cortez and Mr. Crowley’s constituents in New York’s 14th Congressional District, in Queens and the Bronx, but also to anyone who cares about the democratic process. Mr. Crowley, 56, is a powerful congressman who leads the Queens County Democratic Party. Ms. Ocasio-Cortez, 28, has presented him his first major primary challenge in years. Despite long odds, Ms. Ocasio-Cortez, a former Bernie Sanders campaign organizer, has garnered significant support, waging a high-energy campaign and positioning herself as a grass-roots alternative to Mr. Crowley. The candidates have met once, in a Spectrum News NY1 debate last week at which both candidates held their own. Ms. Ocasio-Cortez said on Twitter after the debate that in sending Ms. Palma, Mr. Crowley chose “a woman with slight resemblance to me” as his surrogate. Both Ms. Ocasio-Cortez and Ms. Palma are Latina. For Democrats Challenging Party Incumbents, Insurgency Has Its Limits, By Shane Goldmacher and Jeffery C. Mays, June 21, 2018. By contrast to those paltry five articles before the election, in the few days since, the Times has run more than three score articles where mention of Ms. Ocasio-Cortez factors in. There are pictures of Ms. Ocasio-Cortez galore and video to boot, a positive glut, surely enough to surfeit the most avid fans. Ms. Ocasio-Cortez is not the main subject of each and every one of these articles, but she is a central subject of a very respectable number of them. Since, along with its own by-lined stories, the Times also runs stories by-lined by the Associated Press and Reuters this jump up in number is also a window into their coverage. Sometimes the biggest news stories are what is not being covered in the mainstream press. I guess that's one reason I am getting more and more of my news from sources like the Jimmy Dore Show. Elections- Alexandria Ocasio-Cortez Celebrates Victory in the Bronx (Video) June 28, 2018. New York - Alexandria Ocasio-Cortez: A 28-Year-Old Democratic Giant Slayer, By Vivian Wang, June 27, 2018. Politics- Alexandria Ocasio-Cortez: I’m ‘Unapologetic About What I Believe’(Video), June 29, 2018. Opinion: What Alexandria Ocasio-Cortez’s Victory Means, by The Editorial Board, June 27, 2018. Briefing- Supreme Court, Alexandria Ocasio-Cortez, World Cup: Your Wednesday Briefing, By Chris Stanford, June 27, 2018. New York- Alexandria Ocasio-Cortez Emerges as a Political Star, by Andy Newman, Vivian Wang and Luis Ferré-Sadurní, June 27, 2018. New York- Alexandria Ocasio-Cortez Defeats Joseph Crowley in Major Democratic House Upset, by Shane Goldmacher and Jonathan Martin, June 26, 2018. New York- What Does Ocasio-Cortez’s Win Mean for Cynthia Nixon? By Jesse McKinley, June 27, 2018. Opinion- The Lessons of a Stunning New York Primary, by Frank Bruni, June 27, 2018. Letters- New York Primary Shocker, June 27, 2018. Opinion- Primary Turmoil Visits the Democrats, by David Leonhardt, June 27, 2018. New York- An Upset in the Making: Why Joe Crowley Never Saw Defeat Coming, by Shane Goldmacher, June 27, 2018. New York- Ocasio-Cortez Toppled a Giant. Are These N.Y. Democrats Next? By Shane Goldmacher, June 28, 2018. Politics- Will a Shocker in New York Have a Ripple Effect in Massachusetts? By Katharine Q. Seelye and Astead W. Herndon, June 28, 2018. New York/Big City- Lesson of the Blue Wave Primaries? We’re All Struggling Now, By Ginia Bellafante, June 28, 2018. 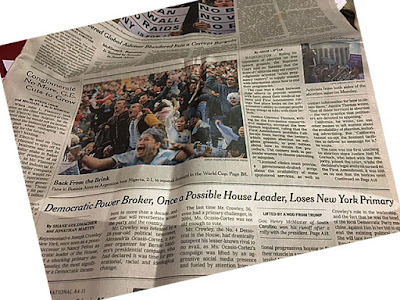 Politics- Top Democrat’s Defeat Throws Party Leadership Into Turmoil, by Jonathan Martin and Sheryl Gay Stolberg, June 27, 2018. Politics- 4 Takeaways From Tuesday’s Primary Elections, by Alexander Burns, Jonathan Martin and Matt Flegenheimer, June 27, 2018. Politics- Here Are the Biggest Stories in American Politics This Week, by Emily Cochrane, June 29, 2018. U.S.- Facing Cuomo, Nixon Looks to Ocasio-Cortez Win, by The Associated Press, June 28, 2018. U.S.- Political Novice Ocasio-Cortez Scores for Progressives in NY, by The Associated Press, June 26, 2018. U.S.- Political Star Ocasio-Cortez Appears on TV's 'The View,' by The Associated Press, June 29, 2018. U.S.- Shock, Then Ambition: Ocasio-Cortez Hopes to Shake Up House, by The Associated Press, June 27, 2018. Television/Best of Late Night- Ocasio-Cortez Tells Colbert: ‘We Changed Who Turns Out’, by Giovanni Russonello, June 29, 2018. Politics- Democrat Joseph Crowley Loses Bid for 11th Term, by Reuters, June 27, 2018. Arts- Guest Lineups for the Sunday News Shows, by The Associated Press, June 29, 2018. Politics- Pelosi Doesn't See Party Shift to Left in Crowley Defeat, by The Associated Press, June 27, 2018. Politics- Is This the Year Women Break the Rules and Win? By Kate Zernike, June 29, 2018. Politics- Stunning Defeat Emboldens Left as Dems Eye New Identity, by The Associated Press, June 27, 2018. Opinion- The Millennial Socialists Are Coming, by Michelle Goldberg, June 30, 2018. Television/Best of Late Night- Seth Meyers Tries to Persuade Kennedy to Stay on Supreme Court, by Giovanni Russonello, June 28, 2018. Politics- How ‘Abolish ICE’ Went From Social Media to Progressive Candidates’ Rallying Cry, by Sydney Ember and Astead W. Herndon, June 29, 2018. Reader Center- Bulletin board- From New York’s Primary Upset to Polling Data, How The Times Is Covering the Elections, By The New York Times, June 28, 2018. Politics- Democratic Heavyweight Loses in New York as Trump Picks Win, by The Associated Press, June 26, 2018. Politics- Democrats Reading Tea Leaves After U.S. Congressman's Upset, by Reuters, June 27, 2018. Politics- Trump Celebrates Victories for 3 Endorsed Candidates, by The Associated Press, June 27, 2018. Politics- High-Ranking House Democrat Dealt Surprise Defeat at Polls, by Reuters, June 26, 2018. Politics- The Latest: In Oklahoma, Republicans Ousted Over Teacher Pay, by The Associated Press, June 26, 2018. Briefing- News Quiz: Test Your Knowledge of the Week’s Headlines, by Chris Stanford and Anna Schavverien, June 29, 2018. U.S.- 10 Things to Know for Today, by The Associated Press, June 27, 2018. New York- Crowley’s Loss Heralds an ‘End of an Era’: Last of the Party Bosses, by J. David Goodman, June 28, 2018. Politics- Primary Takeaways: A Liberal Newcomer Ousts Top Dem Leader, by The Associated Press, June 27, 2018. Politics- Agents Seek to Dissolve ICE in Immigration Policy Backlash, By Ron Nixon, June 28, 2018. Politics- Ben Jealous ‘Just Climbed K2’ in Maryland Governor’s Race. Next Is Everest. By Daniel Victor, June 27, 2018. Politics- Hundreds Arrested in DC Protesting Trump Immigration Policy, by The Associated Press, June 28, 2018. Politics- Trump's on a Hot Streak: Court Rulings, Vacancy, Summit Plan, by The Associated Press, June 29, 2018. New York- New York Today: Who Won the Primaries, by Jonathan Wolfe, June 27, 2018. New York- New York Today: Where the Corpse Flowers Bloom, by Jonathan Wolfe, June 28, 2018. Briefing- Asia and Australia Edition/China, South Korea, Najib Razak: Your Thursday Briefing, by Inyoung Kang, June 27, 2018. New York- Dan Donovan, Aided by Trump, Holds Off Michael Grimm in G.O.P. Primary, by Shane Goldmacher, June 26, 2018. Briefing- Maryland, Supreme Court, Russia: Your Thursday Evening Briefing, by Joumana Khatib and Marcus Payadue, June 28, 2018. Student Opinion- Summer Reading Contest, Week 3: What Interested You Most in The Times This Week? By The Learning Network, June 29, 2018. U.S.- Trump Dubs Heitkamp a 'Liberal Democrat,' Urges Her Defeat, by The Associated Press, June 27, 2018. Briefing- Supreme Court, Disney, Unions: Your Wednesday Evening Briefing, by Joumana Khatib and Marcus Payadue, June 27, 2018. Briefing- Anthony Kennedy, Immigration, World Cup: Your Thursday Briefing, By Chris Stanford, June 28, 2018. U.S.- All Over U.S., Local Officials Cancel Deals to Detain Immigrants, By Simon Romero, June 28, 2018. U.S. Gender Letter: What Should Women Sound Like? By Jessica Bennett, June 29, 2018. Briefing- Europe Edition- Supreme Court, Migration, Poland: Your Thursday Briefing, by Dan Levin and Matthew Sedacca, June 27, 2018. Briefing- Supreme Court, Capital Gazette, ‘Sicario’: Your Friday Briefing, by Chris Stanford, June 29, 2018. Politics- Trump Helps Boost Two Preferred Candidates While Progressive Democrats Gain, by Jonathan Martin, June 26, 2018. New York- New York Today: Where to Cheer, or Cry, During the World Cup, by Jonathan Wolfe, June 29, 2018. Politics- The Latest: ACLU Says Government Wrong to Detain Families, by The Associated Press, June 29, 2018. Elections- New York Primary Election Results, by The New York Times, June 28, 2018.